The Stang has been given a totally new lease of life. German tuning house GME Performance has a clear penchant for American muscle cars. A 620-hp Camaro is an example of what’s in the firm’s portfolio, and now the Ford Mustang has been given an aftermarket package by the Leipzig-based tuner. In order to up the power to 705 ponies and 590 lb-ft of torque, GME took a Mustang GT and added a supercharger kit from Edelbrock that includes an intercooler, uprated fuel delivery system and a remapped ECU. A custom-built stainless-steel exhaust system ensures the Stang has a soundtrack worthy of the engine upgrade, complete with a sound flap system to give the driver some level of control over the decibels being emitted from the upgraded 5.0-liter V8. As a result of these upgrades, 0-62 mph now happens in just 3.9 seconds with top speed limited to 174 mph. The system can also help to prevent buildup in overpressure situations, opening up automatically if it senses a potential issue. To handle all that Hellcat-beating power, the Mustang has been fitted with a height-adjustable coilover suspension with separate bounce and redbound damper control, allowing for bespoke settings to suit both the road and track. High-performance brakes provides massive stopping power. Floating brake discs and active ventilation work to dissipate heat and provide more cool air to the discs and calipers for optimum performance. 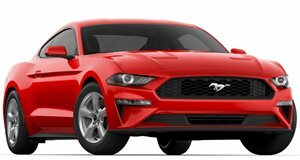 A sporty aerodynamics kit will ensure the Mustang turns heads, with a front spoiler, side skirts, bootlid spoiler and underbody diffuser with a choice of four spoiler designs giving the pony car plenty of attitude.